Newton Hill at Elm Park — Park Spirit of Worcester, Inc.
A wooded sanctuary waiting for you to experience. Just across Park Ave, Newton Hill, the 40-acre section of Elm Park should beckon you to explore its network of trails and ample park amenities. In 2017, the Friends of Newton Hill funded the installation of a flagpole at the summit of the Hill to replace the decrepit fire alarm pole, left over from its prior use. Completed in 2009, the free disc-golf course weaves you around the Hill, experiencing the park from almost every vantage point. 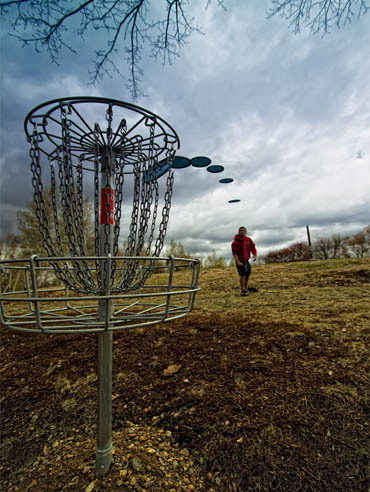 The Newton Hill Disc Golf course is a full 18 hole, par 58 course that traverses up and down the hill, giving players a unique opportunity to enjoy the sport and park, at no cost. Newton Hill, a section of Elm Park since 1888, has been transformed over the past two decades into a welcoming, green oasis. As recently as 2000, Newton Hill was overgrown and unsafe. It's trails were grown-over and impassable. It was a bastion for illicit activity, drug use, gang violence, and illegal dumping. Being largely wooded and largely inaccessible to heavy equipment, maintenance of this section of Elm Park has long been a challenge for the City. In 2001, Rick Miller started a neighborhood group, seeking to improve the park conditions at Newton Hill. Neighbors from the surrounding area would meet regularly to discuss improvement plans. Cleanups were held to remove litter and begin re-cutting the Hill's network of trails. That neighborhood group, the Friends of Newton Hill at Elm Park, began collaborating with other organizations to increase park usage. 5K races were held and concerts were hosted at Newton Square. The Friends of Newton Hill (FNH) have completely revitalized the section of Elm Park that is their namesake and they have done so in a completely volunteer effort. For the past 17 years, FNH has maintained Newton Hill an incredible feat of public service and valuable donation to the City of Worcester. The Friends of Newton Hill became a member organization of Park Spirit in 2003.